Is free a good deal??? from Crazy Quilter on a Bike! I was just reading a comment left by Judith. She's the one who has sold her house, selling many of her household possessions, putting some items in a 10 by 17 storage locker with a support post right smack in the middle - so I guess a boat won't go in that storage space! They are traveling the country for the next year in an RV - a HUGE RV, but that RV also has a finite amount of space. She's a quilter and what the heck does one do with all their fabrics? Retreat Day Five from Crazy Quilter on a Bike! It was so nice to wake up with the alarm at the retreat and not have to get up! However this morning when I woke up before the alarm, I did luxuriate in bed for fifteen minutes before the alarm went off, then I got up. Too much to do to just hang out in bed! In the past, the last morning at the retreat was always a crazy morning with people getting ready to leave from the moment they got up. Now it's a very relaxed atmosphere. Retreat - Day Four from Crazy Quilter on a Bike! It's the last day of the sewing retreat. Times seems to fly past when we're here, but after the last couple of weeks, I'm looking forward to getting home and trying to get into my normal routine. Especially on the eating part. It seems that I have to send out a reminder before every retreat about the desserts. We've eaten a LOT of rich desserts and I'm feeling it. Retreat - Day Three from Crazy Quilter on a Bike! Have technology - will travel. It's all about the technology. I remember one day a couple of years ago when a couple of very uneducated business people in the industry told me that quilters were not technical. I think their thought process was that we cut up fabric, sew it on our treadle machines and that's the extent of our technological knowledge. Well - they are so wrong. I think that each of us here has at least two devices. A smart phone and a tablet or a laptop or a fancy embroidery machine or one of each! Retreat - Day Two from Crazy Quilter on a Bike! I'm on time this morning. I "sleep in" here until 6 AM. I'm usually awake at 5, but you know there's a certain luxury to lying in bed and realizing that technically you don't have to get up. That's a very nice feeling. Quilt Retreat - Day One from Crazy Quilter on a Bike! Here we are at our favorite quilt retreat house. Fireside Retreat in Orillia. After we got Bear safely off to the airport (he arrived safe and sound in case you're wondering), it was time to get home and pack the car for the retreat. I had packed the bags, but they needed to be loaded into the car. Then I was off. Retreat bags from Crazy Quilter on a Bike! There's just too much to share with you!!!! My own stories and things I've found on the internet. Where to start??? I need to get some of these links posted so I can close them in my browser. Otherwise, I'm going to run out of memory!!! Yep - already getting that message. Here is the most adorable little film EVER!!! And I mean LITTLE. Check it out. Watch the first video which tells how the film was made and the second one is the actual film itself. Very cute and has a textile perspective to it. Sewing Retreat - Day Five from Crazy Quilter on a Bike! It's great to be back home and to be able to PROPERLY cook my oatmeal. No bananas in the house so I had to use a nectarine. Not quite the same thing! The girls were happy to see me - of course - they went crazy. But then they are just crazy all the time. I have been slowly working away on The Chickadee block and I am thrilled to say I am finished. I must confess, I am mighty pleased with the way it turned out. This block is the first of 13 blocks I am making that are inspired by Canadian birds and flowers. 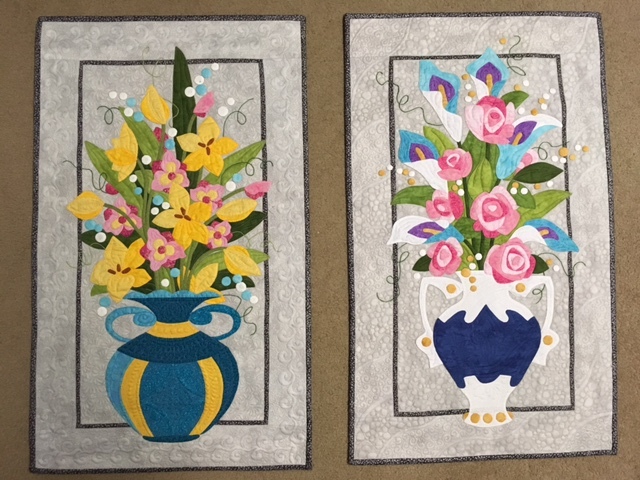 The blocks will be stitched together to create a quilt, although each of the single blocks will make lovely stand alone wallhangings. Your choice! No new surprises out the window this morning. In other words, no more snow, but they are forecasting flurries? Who knows with the weather. The sun was out yesterday and it was a glorious day and I see the sun out this morning as well. It's a wee bit cold though - I think I saw minus 17 on my phone. Yikes! And I want a Tim's? I must get my head examined! Apparently, the thermometer outside says minus 12. Not sure where my phone is registering the temperature. Retreat - Day One from Crazy Quilter on a Bike! So here I am at Fireside Retreat after a crazy day yesterday. I'm waiting for my oatmeal to cook!! It's the only place that I eat this oatmeal as it takes 20-25 minutes to cook. Yesterday was a totally crazy day but I was calm. Very calm. What's the point in getting frustrated when there is nothing you can do about a certain situation except wait? Oh oh - bad news! from Crazy Quilter on a Bike!